What are Post Adoption Pathways? AdopteeBridge helps adoptees request post adoption services (which we call Post Adoption Pathways). The availability of the services depends on your Korean adoption agency and on the accuracy and amount of information in your Korean adoption file. All services are included as a part of Bridge to Korea birthland tours; however, additional fees may be incurred, if additional transportation services are needed, or due to U.S. agency fees. At AdopteeBridge, we firmly believe adoptees have the choice with whom they place their service request. Our staff provides all options to adoptees for these services--whether it be through the adoptee's U.S. or Korean adoption agency, central authority in Korea, or directly through AdopteeBridge. 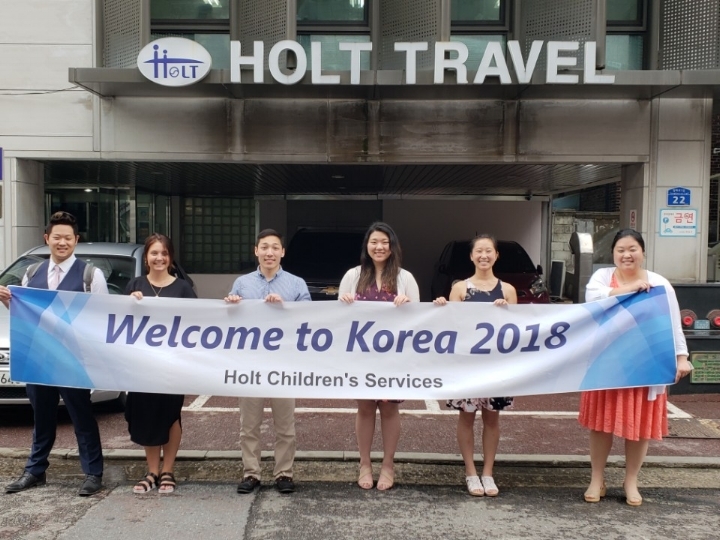 Bridge to Korea staff schedule appointments at adoptees' respective Korean adoption agencies so adoptees and their family members can visit the Korean adoption agency that facilitated their adoption. They will meet with staff (directors, post adoption workers, and other staff) and learn more about the history and present-day mission of their adoption agency. Individual services can also be arranged, if so requested. Bridge to Korea staff will assist an adoptee's request to a review of their Korean adoption file (and if necessary, their U.S. adoption file), for any additional information about their birth story, adoption history, medical information, etc. There is no cost for this service as part of the Bridge to Korea tour package. When travelling with Bridge to Korea's birthland tours, our staff will assist adoptees in an in-person review of their Korean file AT their Korean adoption agency. File Review I proceeds this in-country service. There is no cost for this service as part of the Bridge to Korea tour package. Bridge to Korea will assist an adoptee to request a meeting with their foster mother through their respective Korean adoption agency. If there is enough information in the adoptee's Korean file, the Korean adoption agency will attempt to contact the foster mother to arrange a meeting during the adoptee's trip to Korea. Some Korean agencies ask the adoptees contact their U.S. agency to request this service. These agencies may charge fees for these services. Using information available from the adoptee's U.S. and Korean adoption files, Bridge to Korea birthland tours will assist an adoptee place a request with their respective Korean adoption agencies OR the central authority in Korea (Korea Adoption Services) to start a search for their birth parents. A File Review I will take place during this service. If the search results in a meeting, it will be facilitated by a Bridge to Korea staff member. This service is included as a part of Bridge to Korea birthland tours. Additional transportation fees may occur if meeting occurs outside of Korean adoption agency. If an adoptee is already in contact with their birth family, Bridge to Korea is happy to help facilitate a meeting with previously located birth family members. If a search needs to be reintiated, our staff is also happy to help assist the adoptee through the search process with their Korean agency to find updated contact information with their birth family member. These customized personal mini trips occur outside of the main tour group. Thus, a traveler may miss a scheduled tour activity. Details of this personal mini trip will be discussed individually with each adoptee/adoptive family prior to departure for Korea. Upon review of the timing and any applicable costs, travelers decide on the trip prior to arrival in country. Additional transportation fees apply. Cancellation fee of $50 applicable, if mini trip is cancelled, in Korea. With assistance from Korean police departments, Bridge to Korea will assist adoptees in a visit to a police station to file a missing persons report and DNA sample. This DNA sample is first cross-matched against previously submitted samples, and then stored in the national missing persons database for at least five years. It is continuously run against new submitted samples entered into the system. Adoptees are contacted if a match is found.